Please note: this solution is for Macs with Intel chips only. Before bothering to read on, check “About this Mac” to see whether you have an Intel chip. FLAC is what’s known as a “lossless audio codec”, which means it’s a music file format able to retain all the information from the original source. Many other music file formats (like MP3) are “lossy” – in order to save disk space, they leave out some of the data. If an MP3 file has been made at a high enough bit-rate (the maximum is 320 bits per second), hardly anyone can tell the difference. Lossless codecs, however, are perfect for keeping an exact copy of your music, whether for archiving or as a guarantee against further changes in technology: once you start converting one lossy format into another (MP3 to AAC, for example) there is a rapid fall in quality. FLAC has other advantages as a lossless codec. Unlike WAV, it is able to store metadata – track titles, etc. It uses a clever technique of decompression on-the-fly, a bit like ZIP, so that, while FLAC files are themselves compressed, they are unzipped as they play. Finally, FLAC is Open Source software, non-proprietary, with no restrictions on its use. If you’re reading this, I assume you already have a collection of FLAC files, possibly acquired while you were using Windows or Linux as a computing platform, and now wish to play them on a Mac without the tedious business of conversion to some other format. Songbird is not a particularly lightweight program and I believe development has ceased, or the project has changed hands, or become commercialized. In any case my experiment with it was not a success. Cog failed to run altogether on my Mac. Vox is nice, but ignores track numbers – it plays tracks in alphabetical order, which is especially disastrous for classical music. It apparently also has problems with Lion, the latest OS X. Although Clementine looks promising, it’s in its early stages; my copy refused to work. Amarok is primarily a Linux player, but the OS X version is very definitely in beta. Fidelia is commercial software and I am too cheap to go down that road – the MacBook I’m using for this is on its last legs. VLC is great, and if you just want to play one album at a time and are completely familiar with your collection this is the one to use (hint: sort the playlist by “Author” to get the tracks in the right order). If on the other hand you want a music player that builds a database to allow browsing and searching, as far as I can see your only native-Mac options are iTunes + Fluke, Songbird, Clementine, Fidelia and Amarok. 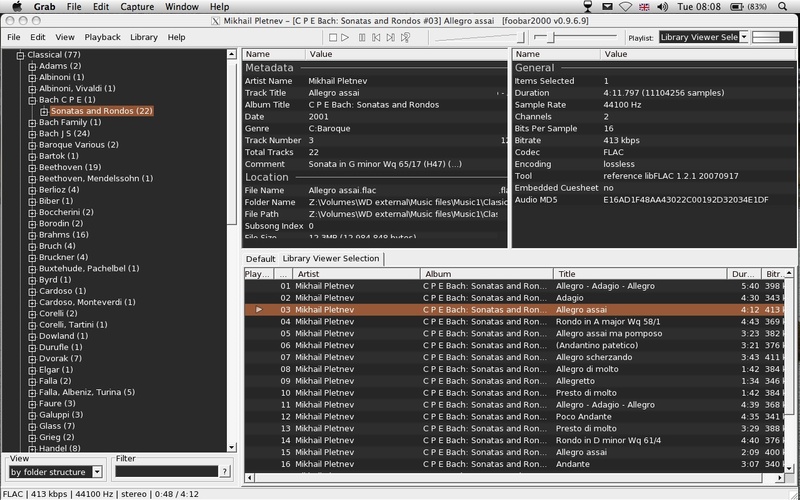 My favourite music player is foobar2000, which runs on Windows. It works reasonably well under Wine in Linux: and Wine is also available for Intel-based Macs. Installing Wine on a Macintosh is not a trivial matter for a non-geek like me: a tutorial is here. I went off in search of a disk image. You can find one listed at Softpedia (be sure to get the 1.2.2 binary). Once the disk image has downloaded, click on it in the usual way and follow the prompts. In Wine-speak a Windows program is called a “prefix”. Grab a copy of the latest foobar2000 installation package here, click on it, and again just follow your nose. 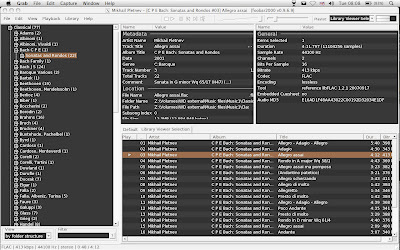 Tell foobar where to find your music (File > Preferences > Media library). If it’s on an external hard disk, keep going up one level in the file browser until you come to a list of technical, Unix-looking stuff, then open “Volumes” and you’ll find your disk drives listed. You can then drill down to the folder where the music is stored. The senescent MacBook in question runs OS X 10.5.8 (Leopard). If you have another version of OS X your mileage may vary, but this is worth a try. Some features of foobar don’t work: checking a file’s properties with Alt-Enter, for example, and the equalizer fails, but software equalizers are not a good idea anyway. If your stereo doesn’t have tone controls, you’re probably not the sort of person who’d use a software equalizer anyway. Finally, when shutting down foobar, be sure to eject an external hard drive from the Mac before turning off its power supply. Next time, turn the drive on before opening foobar. Update, 19.8.12: A commenter suggests aTunes (freeware); Audirvana Plus is another commercial application for the Mac, reasonably priced. I haven’t tried either of these myself as I’ve now adopted a Linux netbook as my music server.